Hello friends, I hope you are all having a nice week. Have any of you ever tried eating a macaron before? Well I love them and they are one of my favorites. They are small pastries that are in the shape of a small round colorful cake, with a cream filling in the middle of the cake, and they come in many different flavors and colors. I love how pretty they look and they taste amazing. Over the holidays I was surprised with a small box of them, shown below, made from the bakery Laduree. Laduree is a Parisian tea salon that began as a bakery in 1862 in Paris, France, and has many locations all over the world. They have two locations in New York City, one in Soho that has a restaurant, and the other location is a shop on the upper east side of manhattan, that sells macarons and pastries. To read more about Laduree, you can click HERE. Macarons are available in many different stores and bakeries such as Laduree, Whole Foods, Amazon, and Dana's Bakery in New York City. I have had the macarons from Dana's Bakery and they taste really good and they just melt in your mouth. The macarons from Dana's Bakery taste just as good as the ones from Laduree. I have seen them also available in Trader Joe's and Costco. Macarons are such a popular trend right now that you don't want to miss. A box of macarons would also make the perfect gift for Valentine's Day. I would love to try and bake them sometime, but I think it's a very involved process, so I'd rather just buy them to enjoy eating instead. 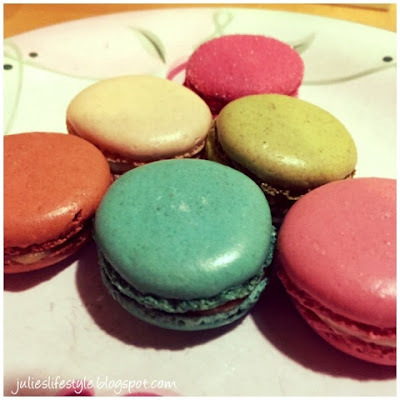 Have you ever had a macaron before or baked your own? PLEASE NOTE: I would also like to thank everyone who commented and gave me advice on my blog post that I did about what is going on with Google Friend Connect and my blogging frustration. You can read about that blog post HERE. THANKS so much for all of your comments, advice, and helpful hints, as I really appreciate your support and blogging friendship. The blogging community is great. I have decided not to use google plus at this time, and to have my followers follow me by Bloglovin, email, and social media. Thanks for stopping by and see all you at the end of the week. I keep seeing these colourful macaroons all over, but have never tried one. My mom used to make coconut macaroons, but I'm not sure if they're even the same thing. The colours and that little beauty of a tin would make me want to buy some up as well! Enjoy ... or are have they already been enjoyed?! They look too pretty to eat Julie! I had one last year at Anthropologie on Mother's Day Weekend. They were good but chocolate is still my choice for Valentine's Day. However, I am giving up all sweets for Lent and Lent starts on February 6th this year...no Valentine's Candy for me this year. We went to the Laduree in Paris last year. It was so fun to pick out the flavors we wanted! My older daughter used to make macarons for us before she went vegan. That actually didn't seem that hard to make, just a little time consuming. They were yummy! I *love* macarons and the ones from Laduree are my absolute favorite - how lucky are you that someone gave you some! Since Laduree, in NYC or Paris, is too far for me, I learned how to make them. Actually, today I wrote about some Valentine's Day ones on the blog. But I do have a question - the dark pink one in your picture, I believe it is Strawberry Marshmallow... was it good? I am thinking of making some because they look so cute! Those are absolutely gorgeous! I have made a few batches before and they are delicious, we don't have any fancy French bakeries in small town midwestern US! We have a French woman who comes to our farmer's market in the summers and sells her macarons and other French pastries. Delicious! My favorite was a lavender-colored one with lavender flavored cream inside. The Laduree box looks so fancy; I have to believe they taste better than the Trader Joe ones! Hello Dear, I think I an going to have to buy some of those! My Mother loved them, but I can't recall eating one myself. What a nice gift to be given! I am sure you enjoyed every melt in your mouth cookie. Have a great evening! What a treat, Julie. I love macaroons as well. They are so good! As well as coconut macaroons, they're easy to make! Oh Julie...what a sweet gift...I love macaroons, and these are just beautiful! So lovely with their bright colours too...hmmm...I am sure you enjoyed them! Have a truly blessed week further! Hugs! Hi Julie! I have water in my mouth... I love macarons and my favorite are the macarons with coffee and raspberry cream. Enjoy your end off week! I love macarons! They're pretty to look at and eat. I wish we had a Laduree store near me. Plus Laduree's packaging is always so pretty Julie. What a wonderful gift! I had one at Disneyland for the first time and have been hooked. But I haven't found them anywhere else. I didn't know I could find them at Costco or Trader Joe's. Thanks for this info! Hi Julie! I'm so happy you like Laduree macaroons and they're really good! I've had some other macaroons and really love them, but would very much like to try out the real thing. I'm so confused by Google right now...argh! I'm a big fan of macarons as well! They're gorgeous to look at and eat. I've yet to try Laduree's because of the usually long wait in the city, but I've been in love with Bouchon bakery's version of them as well. I simply can't get enough of them! Thanks so much for sharing this on #SHINEbloghop this week. We're so happy you were able to join us! yum!! 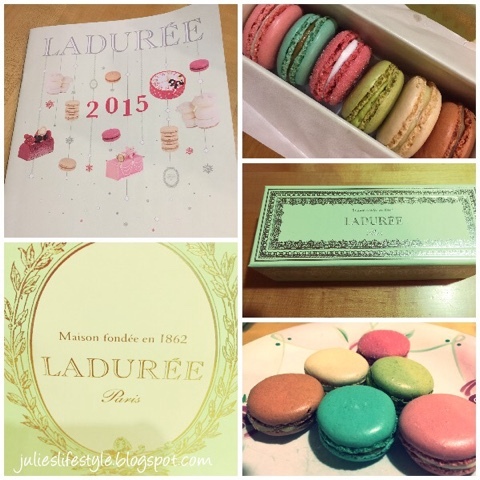 macarons are so delicious and laduree are the best! I'm not too fond of macarons (probably because the ones I've eaten weren't from a good bakery) to be honest, but I love looking at them as they are so beautiful and colorful. I tried making macaroons once and they were a little bit of a disaster! Unfortunately I'm not much of a cook. The ones you were given look far to pretty to eat! Are the different colours different flavours? Yummy looking macaroons. Glad you found the party! And that all your bloggy problems are / have gotten sorted out.Thanks for sharing at the Inspiration Spotlight party. Pinned & shared. Hope to see you again soon. Those look amazing! 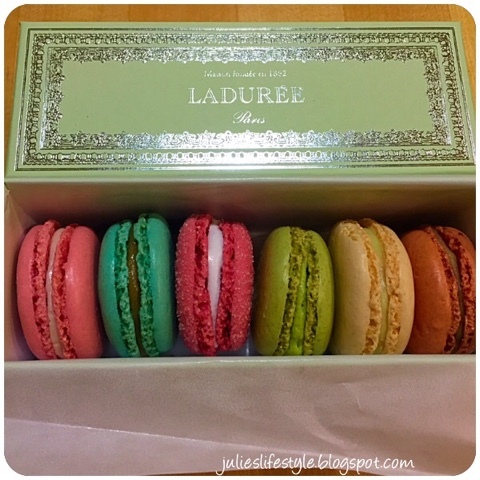 I just love macarons, and I will have to give Laduree a try! These are lovely. Thanks for sharing, Julie!